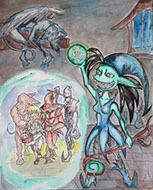 I painted this as my own interpretation of the Wicked Witch of the West from Oz for the Draw Club at my school. 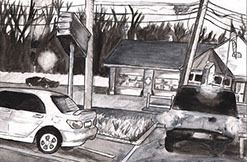 This is based on a photo I took in a Blockbuster parking lot. I'm upset Blockbuster wasn't in the photo. RIP Blockbuster. 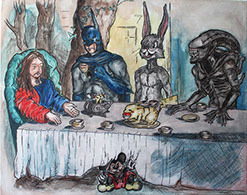 This was a mix of pop culture characters in the world of Alice in Wonderland in the scene of The Last Supper from the Bible. 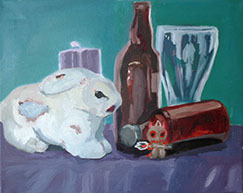 A basic still life painting. Creatures are so much fun to draw. 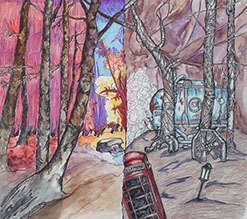 An illustration I did back in high school.